Justice, operated by Tween Brands Inc., is a fashion retail store that focuses on different styles of apparel, swimwear, accessories, and personal care products for girls aged 5 to 15 years old. 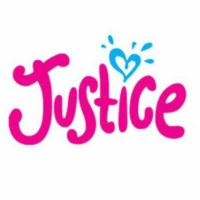 Justice is a brand founded by The Limited Inc., which started as a brand for younger girls/infants. The company then decided to focus on pre-teen girls and thus, established the first Justice: Just for Girls stores in January 2004. As of March 2016, Justice has opened over 1,000 stores with locations mainly in North America and Canada, and some stores in South America, Asia, and the Middle East. Some benefits of working for the retail store include store discounts including all sister brands, health insurance, life insurance, disability insurance, 401(K) retirement plan, and paid time-off among others. What makes the retail store different is how they value the health and wellness of their employees. They offer free wellness classes, parenting classes, and financial planning. They also conduct social activities to engage and promote interaction among their staff. Justice offers job opportunities that cater to a wide age range. The minimum age requirement for basic entry-level positions is 16 years old and these jobs may be part-time or full-time. Justice is a dynamic retail store that offers a wide range of job opportunities. Common jobs are in retail and sales, store management, merchandising and product development, and maintenance. Sales Associate: A Sales Associate is responsible for handling store transactions and assisting customers. Tasks include stocking and organizing shelves, maintaining the cleanliness of the store, handling payment transactions and operating the cash register, and assisting the customer with finding and fitting products. Assistant Sales Leader: An Assistant Sales Leader assists in supervising the team to deliver excellent customer service. Primary responsibilities include recruiting and training new employees, overseeing the team during shifts, supporting strategies to achieve the financial goals of the store, assisting with the merchandise flow, and assist the customers with their shopping. Merchandise Planner: A Merchandise Planner focuses on solidifying connections with suppliers and obtaining merchandise and materials. Primary tasks include working with vendors and suppliers to achieve maximum store profit, creating financial plans, supporting sales and inventory plans, communicating and working with other departments, and developing strategies for optimum production and sales. Warehouse Associate: A Warehouse Associate is primarily responsible for managing the warehouse operations, handling products for deliveries, and shipping to stores. Tasks include packing merchandise into store cartons using a radio frequency scanner, ticketing or re-ticketing products before packaging, sorting returned merchandise, and performing warehouse maintenance duties. Floor-set Associate: A Floor-set Associate is primarily responsible for following and executing the company’s floor-set plans. Tasks include arranging the stores according to the floor plans, moving the merchandise and displays, assembling or moving fixtures, and removing existing or posting new marketing materials. Maintenance Supervisor: A Maintenance Supervisor is responsible for maintaining the effective and efficient condition of stores and facilities. Primary tasks include conducting regular routine tests on equipment, repairing damaged machinery, ensuring the safety of facilities and stores, and complying with standard safety procedures. Allocation and Replenishment Associate: The Allocation and Replenishment Associate is primarily responsible for overseeing and handling the inventory and all related transactions. Duties include closely working with the store management and the merchandising department to ensure optimal inventory stocks, allocate products, and to monitor product trends. Associate Merchant: An Associate Merchant analyzes trends and analyzes and communicates findings to all areas of production, sales and merchandising. Primary duties include working with external partners to test product quality, implementing strategies to maximize inventory and increase sales, and participating in the planning stage of product development. Merchandising Coordinator: A Merchandising Coordinator works with the merchandising team in addressing purchase orders. Primary tasks include performing data entry and other basic administrative tasks, managing product samples, assisting with external communication, organizing purchase orders, tracking all merchandising activities, and assisting in filing reports. General Manager: A General Manager is responsible for monitoring store management. Primary duties include recruiting and training workers, supervising the team during shifts, processing the payroll, analyzing sales, implementing marketing strategies, daily scheduling of tasks, and ensuring the overall smooth operation of the store. To apply, you may visit any of their stores to file an application or go online and apply through their official website. Go to the Join Our Team page and browse through the posted job listings. Both in-store and online applications are accepted. You may access their online application form through the company’s official website. You will need to create an account to be able to proceed with your online application. In filing your application form, bring your complete requirements and submit it along with your complete application form. Note that you may be meeting with the store manager, so make sure to look presentable and professional. For your resume, make sure to organize it in a way that it is easy to read and contains only your relevant information. Include your skill sets and relevant trainings or certifications, if you have any. For the interview, arrive promptly and professionally dressed. Prepare for questions about yourself and your reason for choosing this work, and show your enthusiasm for the job you are applying for. Justice’s culture is all about loving your work. This includes promoting teamwork and collaboration, open and honest communication, and celebrating everyone’s accomplishments. The positive atmosphere enables workers to be productive and to have fun at the same time. News of a mother’s appreciation post to Justice went viral in mid-2017. The mother thanked Justice for making her gender non-conforming son’s dream come true by allowing him to shop at their store, which claims to be “just for girls”. The company is known for their strong and influential brand of pre-teen wear which aims to boost the self-esteem of young girls. They constantly aim to innovate and incorporate new design trends to the clothing style of teen girls. Justice supports charities, donates to local communities, conducts fundraisers, and participates in social campaigns. This is one of the ways they give back to the community. Their main partners are Nationwide Children’s Hospital and Girls on the Run. 1 How old do you have to be to work at Justice?